Courtesy of Diane Campbell, Golden Gate Bridge, San Francisco Bay, California. Diane Campbell wrote a short biographical article on entitled Joe Bruno, Quintessential Bay Swimmer in the Spring 1981 issue of Swim Swim Magazine. Virtually every travel brochure on San Francisco boasts the graceful magnificence of the Golden Gate Bridge. Joseph L. Bruno, however, remembers the days when "Golden Gate" referred only to the 1.2 mile channel of water between Sausalito and San Francisco, where the Pacific Ocean joins the San Francisco Bay. After joining the Dolphin Swimming and Boating Club in 1933, before the construction of the Bridge, he made his first crossing at the age 21. In October, 1980, he completed his 46th crossing from Fort Point to Lime Rock, continuing to increase his record for the most official Golden Gate swims. With the exception of the war years (1942 - 1944), and when a dense fog prevented the competition in 1964, Joe has never missed the event. His times have ranged anywhere from 26 minutes 30 seconds in 1952 and 68 minutes in 1974, depending upon tide and weather conditions. He even found a way to make up for those four years he missed during the war. Due to the increased popularity of Bay swimming, the Dolphin Club has found it necessary in recent years to host the event on two consecutive days. In 1978 and 1979, he swam twice during the same weekends. A native San Franciscan born in 1912, Joe Bruno recalls swimming in Gas House Cove when it was known as "The Hot Pipes" - the part of the Bay that once cooled the turbine engines for the Pacific Gas and Electric Company. 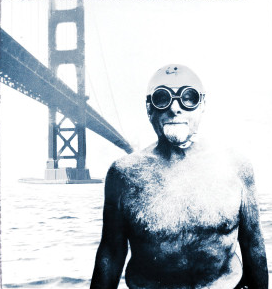 In 1937 he helped the Dolphin's water polo team capture the Bay Area League Championship, the same year he participated in "Discovery Day" by swimming from Pier 31 to Treasure Island to publicize the upcoming 1939 World's Fair. Joe keeps a chart on which he's chronologically mapped all his rough water swims since the thirties. The impressive network details 28 different official routes, including 12 Alcatraz swims and dozens of Aquatic Cove competitions - over 170 San Francisco Bay swims. For Joe Bruno, rough water swimming is more than just healthy exercise. "It's a way of life that keeps me looking ahead," he says. And his Golden Gate swim record becomes more formidable with each passing year.